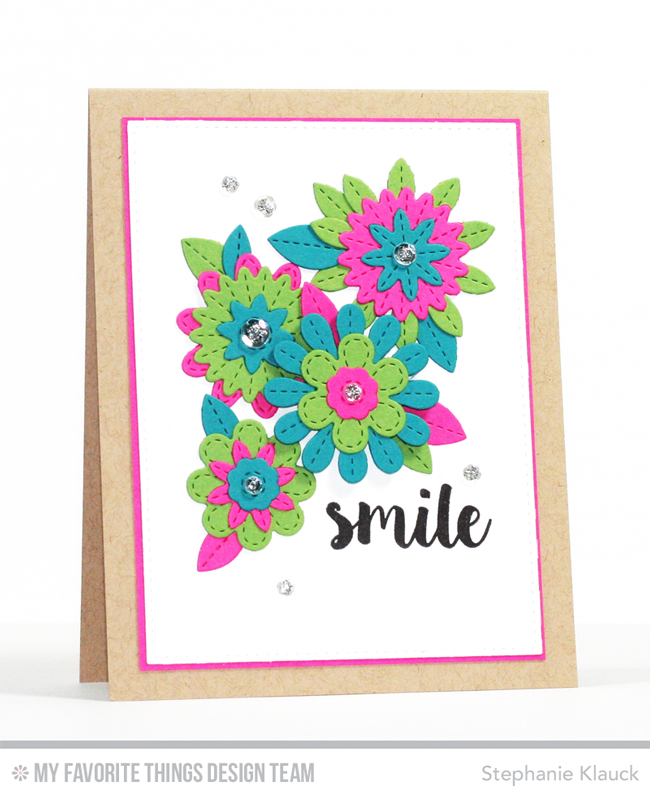 Round Here: MFT August Card Kit Release! MFT August Card Kit Release! Hello and welcome to the release party for the My Favorite Things August card kit - Sensational Stitched Flowers! This fun new all occasion and floral themed kit is now available for purchase in the MFT online store. For my card tonight I decided to create a bright, bold design using the flower dies from the kit along with some of the cardstock colours in the kit. I diecut a bunch of flowers from green, pink and turquoise cardstock and then I glued them together to create 3 layer flowers. Once I had all of the flowers ready, I adhered them onto the card base making sure to leave enough space for the sentiment. I adhered the largest flower with foam adhesive for some added dimension and then I glued leaves (cut from all three colours) all around the flowers. To complete the card, I added clear sequins to some of the flower centers and around them. I also stamped the 'smile' sentiment with black ink before adhering the finished panel to a pink cardstock mat and kraft card base. I just love the colours you have used, gorgeous card. Great card and thanks for all the time you have put into the videos. They are most helpful. Bright and bold as you intended...made me smile! Cute--I like the cheery colors. an easy and pretty card. I love this delightful beauty!! Love the layout and the colors are fabulous. Bright and beautiful card. Love the neutral base. Wow! Love the bright blooms. They look so cheerful! your card makes me smile! Lovely! Wow! Beautiful kit and card! I love the colours you used!! Great card! So colorful and Happy! I am amazed at all the ideas for this wonderful kit! OMG I LOVE LOVE LOVE the colors on this card!!! wonderful colors - the bright pink is perfect with the other colors - love it! So bright and cheery, love it!! Love the three layers and the bright colors. I like the black for the die cut, too. Love the bold colors on the flowers! So pretty!! TFS! Love the bright colors! So cheerful! Bursting with fun! What a great way to showcase the fun flowers. This card just makes me smile. SO happy and cheerful. Love the fun colour combination. So bright and cheerful! Fabulous card! So bright & cheerful! Awesome! Just love the color combination against a white background! Wow gorgeous bright colours! Beautiful! Fabulous color scheme! Love this new kit!